Are closing unused rooms in summer to save money good or bad? Good, but you must do it the right way! Back split home do you close registers on upper levels in winter? Yes, you may do it, but should be careful. Get more info on this page or aqbove. Can a downflow be flipped upside down and be used as an up-flow? Can a duct booster fan be used for clothes dryer? Yes, but only this one on the right! If you have pets in your house, then yes. Can HVAC pull hot humid air in from attic? Yes, if the return duct isn't properly sealed or disconnected. Can I add a register here? Yes, but it may effect the supply on either side of it. Can I add supply vents without return in basement to reduce radon? No, you have to install a radon mitigation system. And you can but radon mitigation fan on the right. Can I install a bath fan into cold air returns in my house? If you want to find out what your grandpa had for breakfast, then yes. Can I put a cold air grill in the cold air return next to my furnace? No, it should be at least 10' away. Can I put a cold air return on an inside wall? Well, you should avoid a cold air return on the exterior wall. Can I put a furnace vent in my bathroom floor? No, it should be on the wall or you can install a toe kick 90* boot under the cabinet. And you can buy a toe kick 90* and registers on the right. Can I run my dryer vent from main floor down and across basement ceiling? Yes, you can, but it should not be more than 25 feet in length. Otherwise, you have to use a duct booster. You can buy the best dryer exhaust booster on the right. Can I split the 10" supply duct into two 6" lines and have 2 smaller vents in the room? Split it into two - 8" ducts. Can I use the same heat duct to heat two rooms? Yes! You can find more info for this topic in Chapter #8 or below. 8. Bathbox for Two Rooms* – the chapter describes what should be done to the bathbox to make it works for two rooms. Also the chapter has a brief description of the uncommon case of the field made bathbox. The chapter has 4 pictures; 3 pages*. $2.00 (Instant Access). On 06/15/2013 text of this chapter was significantly modified and improved. Can I vent microwave range hood exhaust up between the studs? Absolutely! For more info, please visit Chapter #27 or below. hood, Jenn-Air fan; explains roof and wall caps installation; covers ductwork installation. The chapter has 18 pictures; 9 pages*. $2.37 (Instant Access). On 05/16/2013 text of this chapter was significantly modified and improved. 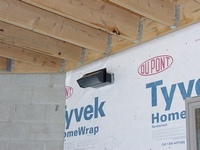 One examples of Pulte Homes ductwork installation was also inserted in this chapter. 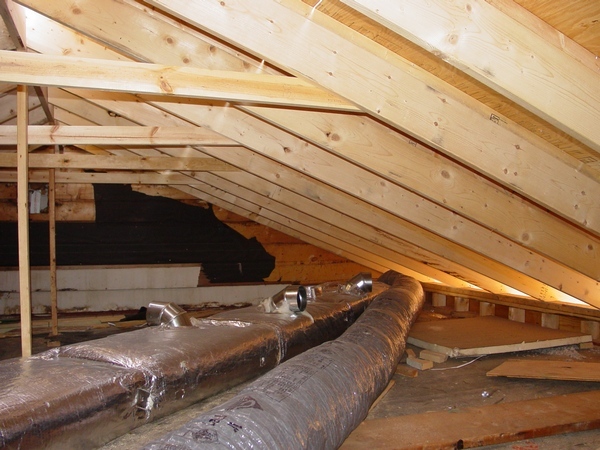 Can sweating ductwork in crawl space become an issue? Can two dryer use the same exhaust duct? Can you install HVAC evaporator coil in cold air return? Yes, in commercial applications it is always on the return side. Can you put additional insulation over attic ductwork? Yes, you can, but it must have a vapor barrier. Can you put duct work lower than your furnace? Yes. You can run it in the crawl space. Can you recognize a down flow type furnace by the return ductwork that is installed on the top of the unit? Can you run central air in a house with a finished basement? This is difficult – you must remove the ceiling. Carrier condensate drain, do you have to use both drains? If it sits in the attic then yes, if in the basement then no. You shouldn’t crimp flex unless this is a rigid aluminum one. But if this is a case it’s not much different from any sheet metal pipe. Dirty feet odor when central unit is on. They name it dirty sock syndrome. Do I need a fresh air intake with boiler & in floor heat? Do I need to have an attic fan installed when my split system air-conditioning ducts will be in the attic? It depends, in the dry climate you may need one, otherwise please read through these pages, but through all of them! Do newer furnaces need cold air return ducting? Absolutely, check it out in Chapter #40 or below. 40. Cold Air Return Duct Installation#– the chapter covers a wide variety of the different aspects of work that is necessary to know in order to be able to install the cold air return duct, such as: how to take measurements and how to cut in a canvas, how to put together a duct, fold drives, and nail hangers. The chapter explains how to hang a duct if you are working alone or with a helper, how to install a cold air drop etc. 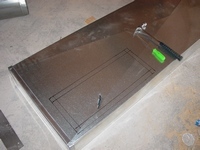 In addition, there is a description on how to take a measurement and cut a piece of duct. Furthermore, the chapter explains how to make measurements and cut openings for cold air returns in the duct, and describes three ways on how to connect two ducts together. In the end, the chapter represents a few uncommon cases of the cold air duct installation. The chapter has 72 pictures; 40 pages*, $3.50 (Instant Access). On 09/22/2013 text of this chapter was significantly modified and improved. Two pictures added. 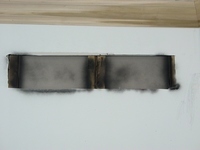 Do you need dampers for ducts in finished ceilings? No, they might vibrate and make a lot of noise. I have some adjustable elbows for 4" ducts that I'm using for an exhaust fan vent. However, it is virtually impossible to get the end sections of these elbows to turn (some of the middle sections turn easily). I haven't used this type of elbow before so was wondering if I just have defective ones or are there any tips for getting all sections of an adjustable elbow to turn smoothly? Would a lubricant sprayed into the joints help? Even new ones can be hard to get to turn. Spray some WD-40 on the joints. In general, if nothing works, screw it to the stud or something then you can use both hands to turn it back and forth. Does blocking off vents to the basement lower heat bill? Does closing basement air returns harmful to A/C? No, unless there are not enough cold air returns in your house. Does closing one vent push more air into other rooms? Does evaporator coil that fit on top of a forced hot air furnace restrict airflow? Does insulated condensation line caused freezing of air handler? Does it matter if I install and up flow or down flow furnace? It depends on the design of your duct system. Does moving the cold air return higher help in the summer? Does the duct silencer go before or after the inline fan? After. And you can buy it on this page. Does the ductwork and elbows effect how long it takes to dry clothes in a dryer? Free YouTube video how to install ductwork. Heating and cooling ducts in basement are sweating. Get info on this page. How close can fresh air intake and exhaust fan? 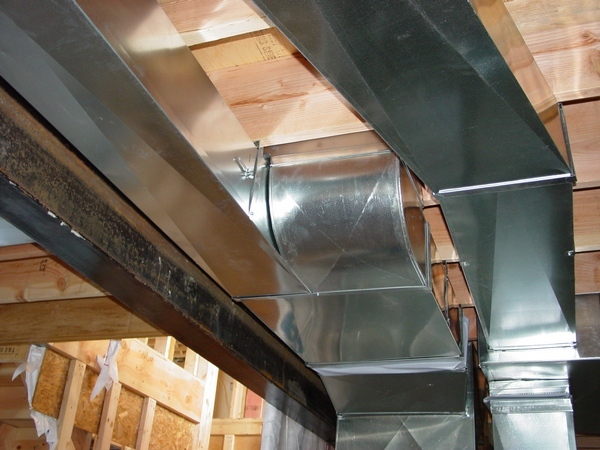 How difficult is it to add ductwork to a split entry-level house? Well, it is not simple, just check it out here. How do I move air ducts basement remodel? Head, hands, tools, materials, Ductwork Installation Guide book! How do you hook up a wood furnace to a gas furnace? 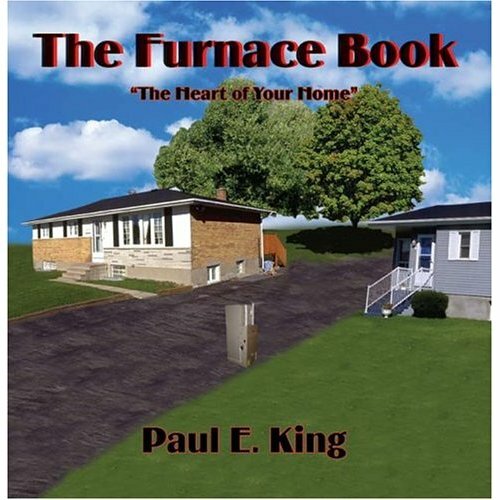 I have a manual on the Furnace Replacement in Pictures page. How many fresh air returns do you need? You need one fresh air intake for each furnace. How many HVAC vents do I need in my basement? It depends, however, in general, one for every room, bathroom and mechanical room and from two to five in the great room area. How much electricity could you save by plugging fresh air intake? Quite a bit - if your house is sealed tight. How much for a HVAC professional to add a cold air return in the basement? Nothing, just do it yourself! How much to replace ductwork in crawl space? How to balance an HVAC system? Balance it with the dampers, registers and magnetic shields. Buy magnetic shields on the right. How to calculate how many vents should be left open for a heat pump blower fan to operate properly? Well, I have a special page dedicated to this issue. How to connect rectangular ductwork together? You can learn it in the Chapter #40 from my Ductwork Installation Guide book or above. How to get rid of lint and moist air from clothes dryer when it exhausts in a garage? Why would you exhaust it in the garage in the first place! How to hide ugly PVC pipes from venting on outside? You can paint it, or replace with a concentric kit. Purchase it on the right. How to increase airflow in existing duct? You can use a Duct Booster Fan that you can buy on the right. How to increase airflow long runs of ductwork? There are quite a few options, see them all here on this page. How to install a wall register into a heat duct? This is also a simple question, but you would be better to read about it in Chapter #52. On 10/30/2011 text of this chapter was significantly modified and improved. How to install defective flex ac duct? Do not do it for Christ sake! How to install ductwork properly? Well, this is very complicated question and if you are damn serious about that buy my Ductwork Installation Guide book. How to install high efficiency furnace? You may find all the information you need on this page. And you may purchase a furnace on the right or get more models on this page. How to insulate a dryer vent? You should not insulate it unless it runs through an unconditioned crawl space or attic. How to insulate bath fan exhaust? If you live in the dry climate, bury it under insulation or replace it with the insulated flex, otherwise just replace it. How to make attic cooler for air handler? You can use an attic fan or insulate the roof in order to make a conditioned space. Buy an attic fan on the right. How to penetrate an outside wall with PVC pipe? If your house is finished by siding you can use a hole saw, if by brick visit the Split Level Ranch Remodeling page to see some useful pictures. Buy a hole saw on the right. Are you planning a remodeling of your house? This is great! 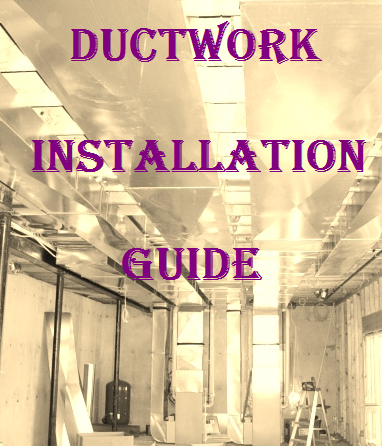 From now on, you can get huge amount of information that will help you to find the right way of dealing with the ductwork installation issues. 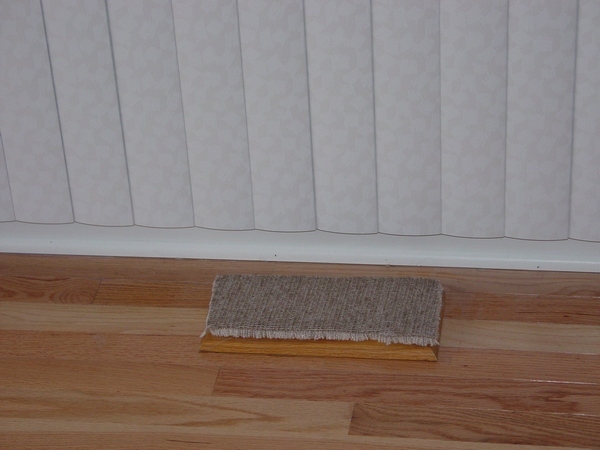 What if you only had baseboard heating in your house and decided to install a central air? Now you can do it by yourself or just get an idea on how it should be done and now you can help your heating contractor to implement this idea into a real life! On this page, you can see 85 photos with brief explanations to them. Also, you can ask your questions or visit some paid pages, which are related to the photos on this page. Price for the instant access to the page is only $2.00. How to provide fresh air to clothes dryer? While some inspectors are making it mandatory, in the most cases you do not need a special fresh air intake for the clothes dryer. How to relocate a supply vent that is exiting on other side of shared wall? If you have this kind of issue at your hands send me some pictures and I'll tell you what to do. How to replace an A/C line? Pump the refrigerant out, cut the line, and replace it. And you can buy one on the right. How to run air ducts to garage? It's against the code to run heating ducts to the garage. How to unclog condensate drain line on a split type cooling unit? There are three ways of doing that: purge it with nitrogen or compressed air, use of a special pump, or a piece of wire. I need to bring 400 cfm fresh air to my A/C. It's a lot of air, you may need to install an Energy Recovery Ventilator. If exhaust vent is installed incorrectly can it cause the microwave to overheat? Is condensation normal on ductwork? Is furnace legal in garage? I have no idea what a Jenn-air microwave installation is, but if you are thinking about them separately then find step-by-step instructions on this page. Our hvac system is undersized will duct fans help the hot/cold rooms? Learn how to use it on this page. Pictures of old furnaces and exhaust pipes. See them all on this page. Positioning of heat and cold air return in basement theatre room. You should have at least two heats on the ceiling and one return high on the wall. Should I pull the fuse out of the disconnect before you go to bed? Yes, if you live in Detroit. Some of the metal tape came off on my furnace. So, what’s the problem? Just replace it. Buy on the right. Wall fresh air intake vent is too close to the floor. Most likely this is a combustion air intake, should be 12” off the floor. Water pipe noise making contact from air ducts. It should not touch any ducts – period. What are the tapping noises and pops in ventilation ductwork? Well, if you want to educate yourself for this topic and find a solution please read on this page. What can be put through a condensate pump to clean out the debris? Just take it apart or replace it. Follow the link to purchase it below if you need to replace the old one. What can I do to stop register vent from whistling when closed? Close the damper on the pipe too. What causes moisture in the clothes dryer? What causes the central air conditioner unit to use the secondary drain instead of the primary one? What could be blocking the airflow in my ducts in certain rooms of the house? Check the dampers first, if they are open please read on this page. What happen if I do not have a cold return vent in basement? Nothing - if it's an unfinished basement, but you must have it in the finished one. 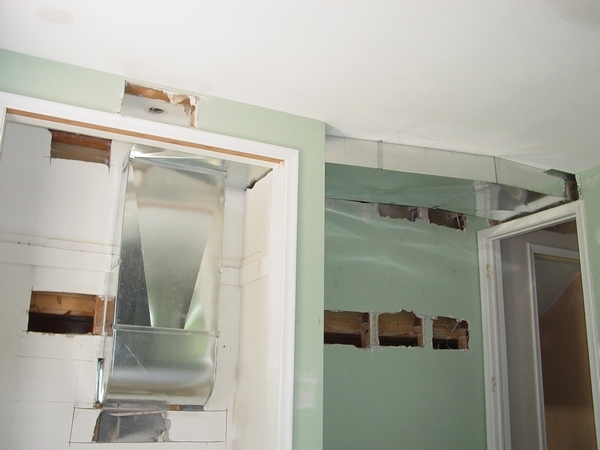 What happens when vents are shut on ductwork for central air? What happens if I replace 6 inch duct with oval? What happens if my water heater draft inducer stops working? What is dryer exhaust ground clearance? 12" or above the snow level. What is the best way to tap into an insulated duct to install a new ac vent? Cut the flex, install a prefabricated tee or just make one (see Chapter #45). And you can buy one of these Tees on the right. What makes more noise round or rectangular duct? What to do about sweating air conditioner flexible ducts in crawl space? Please find an answer to this question on this page. What to do if in the finished basement ducts sweat? Put in basement a dehumidifier or just purchase one on the right. What to do with old vent hood duct and roof vent? Our new kitchen plan calls for removal of our old vent hood (new one will be in a different location). What should I do with the existing roof vent and duct? My contractor wants to charge me $500 to remove the old vent and cap the duct inside the rafters. Is this necessary, or is it okay to just leave it open (venting into the attic) and also leave the roof vent in place? Seems like I could easily save some $ and do the work myself if I only need to remove the old vent and any exposed ductwork, and fill in the leftover hole in my ceiling w / a drywall patch. Remove as much duct as possible, all the way to the roof cap, if possible. Ducting will have grease residue so get rid of it. Plug the roof cap or use it as a roof vent until the next roofing job. Then get rid of it. Seal the ceiling hole with drywall and finish it. When crimping round duct what is the tool supposed to be? You can use a crimpier or long nose pliers. You can buy both on the right. When you patch large holes in plenum, what's best method to make sure patch piece doesn't fall thru while patching? Will remove a 7" round starting collar from top side of plenum. Move it to another location. This is 1" duct board. I would cut a "plug" to fit and use shiny aluminum foil tape to seal the "seam". If you cut the "plug" about 3" - 4" too large and then cut back the fiberglass leaving the fiberglass the same size as the hole . 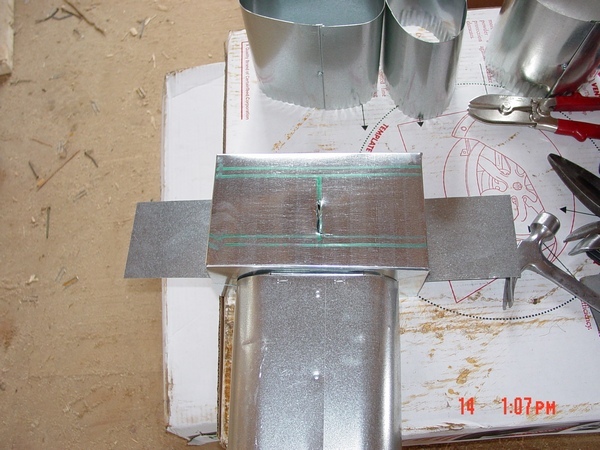 You then have a foil "flap" to overlap the existing duct board . Seal with foil tape . Where can I see pictures of kitchen vents with microwave? 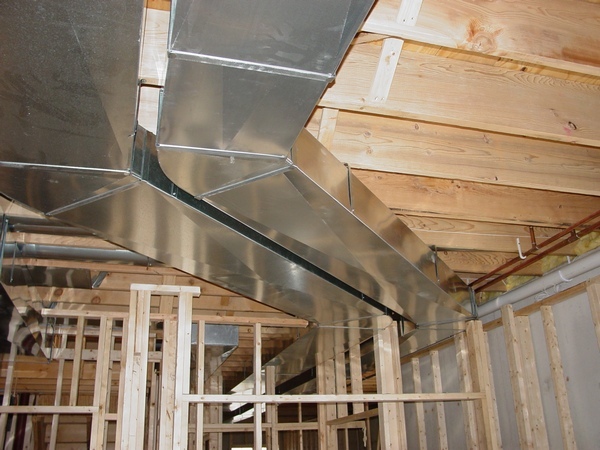 Where is the easiest placement of ductwork in the basement for HVAC? Where they are suppose to be according to the blueprint. Which way do the crimped end to run cold air return in heating system? Why air conditioning condensate blow off? I have a lot of info for this topic here, please read it all. Why are my air conditioner's ducts sweating in my crawl space? I have an answer to this question on this page. I discovered a wet floor under the plenum and noticed the water was coming from the plenum. I opened one corner and a lot of water poured out. We have discovered some water the past 2 summers, but this year seemed worse. Why do my HVAC vents "bang" after I put in a new heat pump? If they changed the evaporator coil it probably means that your former coil was very dirty, but now when it's clean your ductwork appears to be undersized. Why do you need an outside air duct for a gas furnace? Why is cold air coming out of the primary condensation clean out? Because it should be capped off. Buy one on the right. Why multiple warm air returns for a/c? Would a too small of a return air grille and filter cause the attic mounted air handler to sweat and cause condensation? Will installing dampers in ducting hurt the air handler? Work out 45 degree angles when fitting ducting.